Subscribers can get the time travel car for Colt Express for only 2 Euro plus shipping costs here in the shop. Non-subscribers can get it for 4 Euro plus shipping costs. Reviews and more: Spyfall, The Bloody Inn, Bretagne, Oh my Goods! and more. 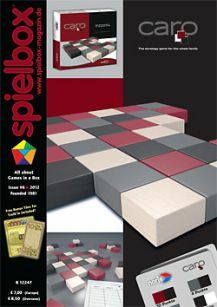 10 pages from the International Toy Fair Nuremberg and how to play in Thailand. This Product was added to our catalogue on Thursday 15 November, 2012.